So can you remember that really horrible decision you made in high school? 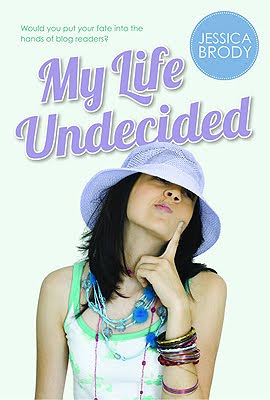 Yeah, so can Brooklyn Pierce, the main character in GCC Member Jessica Brody’s new novel, MY LIFE UNDECIDED out this month through FSG. But would you ever let the blogosphere decide your life for you? She did. And I can’t wait to see what happens. Jessica: Well, I’m not sure how funny it is. At the time it was actually kind of scary. My mom and I were driving from Colorado to California and we ran out of gas in the middle of Utah…in the middle of the night. It was totally dark and there was no cell phone reception so we couldn’t call AAA. We had to wait for a trucker to pull over. He offered to drive to the next town, buy us some gas, and drive back with it. Thank goodness he did, otherwise, who knows how long we’d be stuck out there! Jessica: The short answer is yes, I’ve always wanted to be a writer. Although it took me a long time to figure that out. In second grade I turned in a four page book report (the assignment was to write one paragraph) and the teacher made such a huge deal about it. I really couldn’t understand why. Writing just came naturally to me. At that moment I remember wanting to be a writer. But somewhere along the way I convinced myself that I needed to get a “serious” job…you know, one that comes with dental insurance. So I majored in Economics in college (very serious!) and went on to be a financial analyst for MGM Studios. It wasn’t until later that I realized “serious” wasn’t for me. So I quit to pick up where I left off at age seven. Jessica: I drove. Seriously. I was so excited to finally get my license I think the first thing I did was hop in the car and speed off into the wind. Jessica: Outline! Outline! Outline! LOL. It’s true though. I never start writing until I have a concrete outline done. And I use a very special “tool” for my outlines. It’s called the Save the Cat Beat Sheet and it was invented by the amazing Blake Snyder, author of the Save the Cat screenwriting books. He’s a genius! The beat sheet was actually created for screenwriters but I found it works just as well for novels (or any story, actually!) and so now I never write another book without it! Q: Where were you when you found out that Endless Summer was going to be published? Tell us the story. Jessica: I was in my home office (which at the time was in the dining room of my tiny apartment) when I got the call from my agent. I remember it feeling very surreal. I couldn’t bring myself to believe it. To this day, four books later, it still doesn’t feel real. I wonder if it ever will! Thank you, Jessica! And if you’d like a visual peek inside the world of Brooklyn, check out Jessica’s fantastic new book trailer. Now, everyone go out and buy books, lots and lots of books! ‹ Please Help Me Welcome Baby Juliet!